There are huge changes taking place in the world of biosciences, and whether it’s new discoveries in stem cell research, new reproductive technologies, or genetics being used to make predictions about health and behavior, there are legal ramifications for everything. 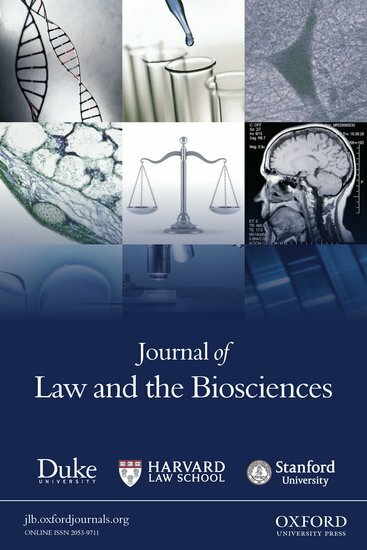 Journal of Law and the Biosciences is a new journal published by Oxford University Press in association Duke University, Harvard University Law School, and Stanford University, focused on the legal implications of the scientific revolutions in the biosciences. We sat down with one of the Editors in Chief, I. Glenn Cohen, to discuss the rapidly changing field, emerging legal issues, and the new peer-reviewed and open access journal. Why have you decided to launch Journal of Law and the Biosciences? This is an incredibly exciting time to be working in these areas and in particular the legal aspects related to these areas. We are seeing major developments in genomics, in neuroscience, in patent law, and in health care. We want to be in the forefront of this, and we think that a peer-review journal led by the leading research institutions working in this area in the United States is the way to go. How has this subject changed in the last 10 years? The genomics revolution, the reality of cheap whole genome sequencing, further developments in the ability to examine neuroscience, the realization that biosciences are a crucial aspect of criminal investigations, and the importance of research ethics have all become more prominent, as have roles that law and the biosciences play in the criminal justice system, health care delivery, and our understanding of ourselves. What are the major intersections of law and the biosciences? Neuroscience, genetics, research ethics, human enhancement, development of drugs and devices in biologics, and medical ethics, and many others. What is it that makes this such a fast growing area of law? First, we are fuelled by development in the biosciences, which is moving at an increasingly fast pace since we can build new technologies over old technologies. Second, there is increasing interest by jurists and by lawyers in these areas. Third is an increase in interest in health care and sciences more generally. From President Obama’s announcement of a major enterprise in studying the human brain to the passing of the Affordable Care Act, we are seeing a golden age in this field. What do you expect to see in the coming years from both the field and the journal? The ethical issues that have always been in the background are going to be made much more pressing, such as with cheap whole genome sequencing, fetal blood tests called non-invasive genetic testing, and increasingly science-based attempts to restrict abortion rights. All of these are raising questions that have always been present but are making them more pressing and also making it more likely that courts and legislatures will have to be the ones to wrestle with them correctly. We are hoping that the journal plays a role in answering those questions. Last year, with the Advanced Notice of Proposed Rulemaking (ANPRM) and revisions to the common rule in human subjects’ research, there has also been a lot more emphasis and rethinking about the rules by which science operates at the level of human subject research regulation. What do you hope to see in the coming years from both the field and the journal? Increasing number of law students and non-lawyers realizing the important role that law has to play in these disputes and enabling discourse at a deeper level than we have seen to this date. What does Journal of Law and the Biosciences expect to focus on within the field (trends / new approaches)? Stem cell technology, reproductive technologies, law and genetics, law and neuroscience, human subjects’ research, human enhancement, patent law, food and drug regulation, and predictive analytics and big data . . . but those are just off the top of my head. We are hoping to get submissions in many more areas as well. Nita Farahany, I. Glenn Cohen, and Henry T. (Hank) Greely are the Editors of the Journal of Law and the Biosciences. I. Glenn Cohen, JD, is Professor of Law and Co-Director of the Petrie-Flom Center for Health Law Policy, Biotechnology & Bioethics at Harvard Law School. Cohen’s current projects relate to reproduction and reproductive technology, research ethics, rationing in law and medicine, health policy, and medical tourism. Nita Farahany, PhD, JD, is Professor of Law & Philosophy at Duke Law School and Professor of Genome Sciences and Policy at the IGSP. Since 2010, she has served on Obama’s Presidential Commission for the Study of Bioethical Issues. Henry T. (Hank) Greely, JD, is the Deane F. and Kate Edelman Johnson Professor of Law at Stanford University, where he directs the Center for Law and the Biosciences. He chairs the California Advisory Committee on Human Stem Cell Research, is a founder and director of the International Neuroethics Society, and belongs to the Advisory Council for the National Institute for General Medical Sciences and the Institute of Medicine’s Neuroscience Forum.